Wednesday brings us to Jan Hunter! She has a delightful sense of design. She has so many more bright and interesting projects to come! Fall has arrived and Halloween is just a few days away! Need something that works up quickly? This may fit the bill. 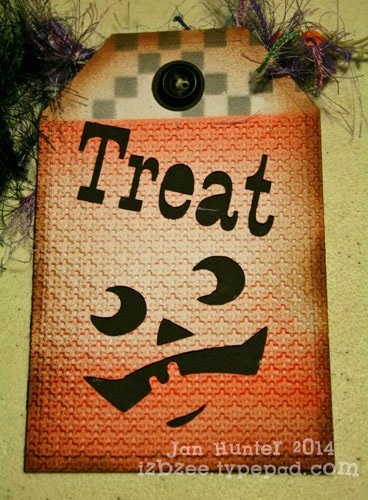 If you're using an electronic cutter, using your basic shapes library, resize a tag to 5 x 7 inches. copy and paste it an additional two times on your mat. 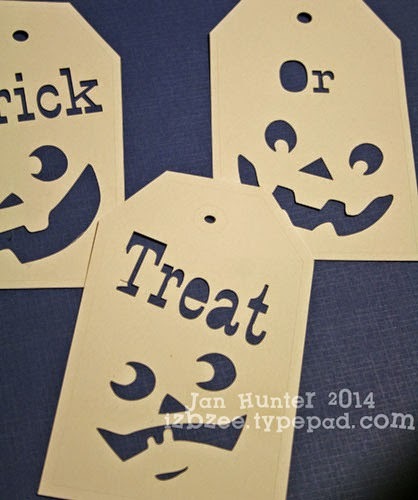 Add the desired facial features to each tag front. Add the text to each tag as desired. Make that that all lines are set to cut. I added a shadow layer the same size as the original tag, hide it while you cut the tags in white paper. Cut only the shadow with the black cardstock. Emboss the lower section of each white tag piece with your choice of embossing folder - leaving the top of the tag unembossed. With a chackerboard stencil secured in place on the top part of the stencil, spray with the eBrush as desired, making sure that the bottom of the tag is protected from overspray. 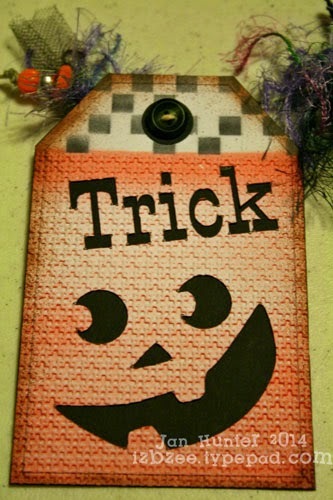 Now, cover the upper portion of the tag while you spray the bottom section of the tags. Adhere the black backing now. If desired, you can use the eBrush and the brown sharpie and lightly spray the edges of all the tags for an antiqued or distressed look. String your banner together. I used a button to secure the cording to each tag. Add fibers, netting, beads, buttons or any other embellishments you desire to complete your banner for hanging. 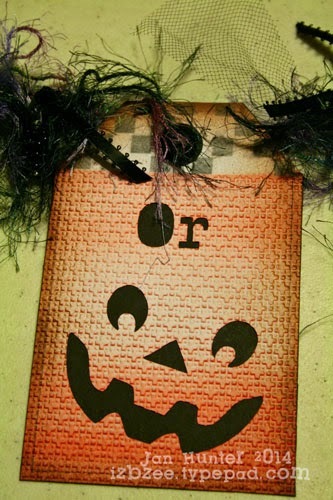 Thanks for dropping by and hope you'll enjoy some last minute Halloween crafting for your home or as a gift! Wonderful Project, Jan! 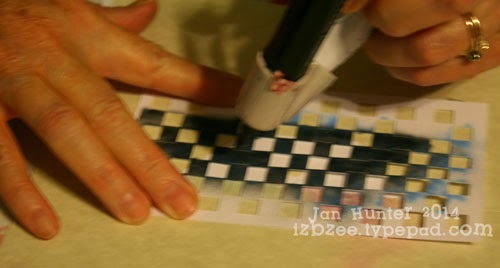 We love Jan's creations and you can learn and share with her by visiting her blog. Also don't forget to join eBrush by Craftwell Facebook group! So cute, Jan! I'm falling in love with the eBrush. I love all of the shading and dimension you added with it. Awesome! Great banner Jan, love it! Darling banner. I really need to get an eBrush. You would love it Sue! Love your banner Jan, beautiful!